Select Extensions → Language Manager from the drop-down menu on the back-end of your Joomla! installation or click the icon Language in the control center. Under the content tab click on the language to edit. 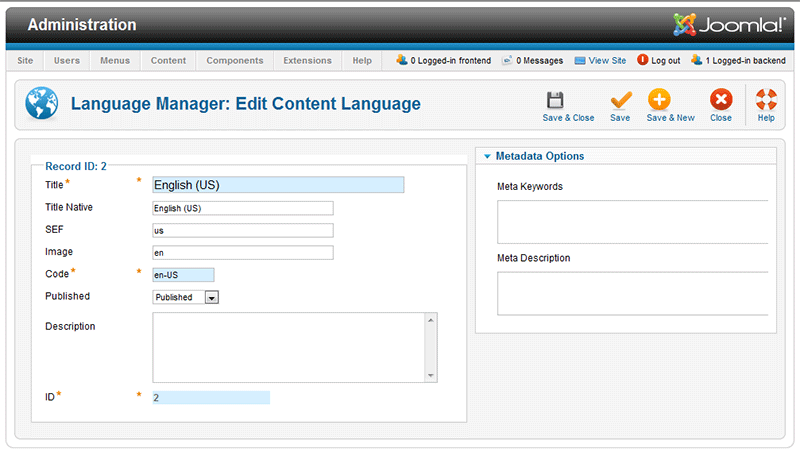 In the Language Manager: Edit Content Language you can set the title, SEF, image, code, and description of the installed langauges. You may also update or add meta keywords and description. Title. The name of the language as it will appear ion the lists. Title Native. Lenguag title IN the native language. SEF. SEF for this language. If 'en' is used then it will be added after the site URL. Example: http://mysite.com/en. Note: The prefix must be unique over all the languages. Code. Enter here the language tag - example: en-GB for English (UK). This should be the exact prefix used for the language installed or to be installed. Site. Shows the Languages available for the Front-end of the web site. Administrator. Shows the Languages available for the Back-end of the web site. Note that the languages for the Front and Back end can be different. Additional Languages can be added using the Extension Manager - Install Screen. If desired, you can show the Front-end site in one Language and show the Back-end administration pages in a different Language. Also, individual articles can be configured to use a different language in the Advanced Parameter pane when editing the Article.